12-year-old Stacey discovers the secret to communicating with animals. Animals rejoice, thinking she is their long awaited savior who can return them to ZoaBrio (pronounced Zo-ah-BREE-oh), a land where animals and humans once lived as equals. But not everyone loves a savior. A clan of cats has kept the secret hidden from humans for generations, ensuring that cats and dogs remain humans' favorite companions. They are determined to destroy Stacey and keep her discovery a secret. Stacey must find and overthrow them before they silence her forever. Voices for All is an adventure comedy about friendship, freedom, and equality, no matter what your species. 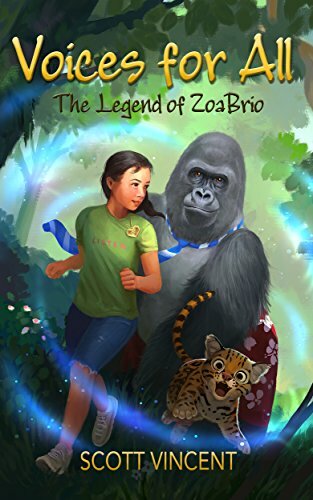 Join Stacey, her friend Alex, a wise-cracking gorilla, and a cast of animals yearning to be free as they fight for a world where animals are not as voiceless as we once thought. I respect your privacy. You may unsubscribe at any time, and I will not share your contact information. "This is a wonderful adventure full of fantasy and humor, which is sure to grab young readers until the very end." "This is a fun middle-grade fantasy adventure with plenty of humor...light-hearted and entertaining, reminding me of the movie Cats and Dogs." I love animals. Big ones, small ones, furry ones, feathery ones, and scaly ones. But mostly furry ones. When I was a kid, I was surrounded by a menagerie of critters. My parents had just about every animal that was typically on a farm (except cows, for some reason). We also had some "exotic" animals like llamas, peacocks, chinchillas, and a ferret. Growing up with animals, I realized they are smarter than we think. I always wished I could talk with animals so that I could understand their thoughts and feelings. And their jokes. I once volunteered at a zoo. I had the great privilege of playing with a baby tiger, giving a hippo a bath, and being pooped on by a spider monkey. Good times. I live in Southern California with my wife, daughter, and son. My first novel, Voices for All, evolved from a story I created with my kids. I hope you enjoy it as much as they did.